The Intex Swim Center family pool is a great thing to have in your backyard. 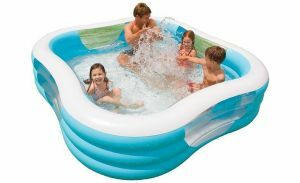 The inflatable pool can be used by the entire family to have some relief during summer. One of the benefits of the Swim Center family pool is that it is made of heavy 13-gauge vinyl that's quite sturdy. It makes the pool durable enough to last for a long time. Another advantage of this material is that it is quite easy to clean. You can simply deflate it and keep it anywhere in the house, when it is not in use. As the Intex family pool measures 90 inches in length and breadth, it offers ample space for your little one to splash and play in water. The pool features wide walls on all four sides, which offer stability to keep it in place. These walls measuring 22 inches when inflated add to the comfort factor as well. See-through windows are provided on each of the walls of the 90 inch family pool to make it easy for you to keep an eye on your kid while he or she plays in the water. A draining plug facilitates emptying and storing the pool for later use.